GoGoKid Review: Is Teaching for GoGoKid a Scam? GoGoKid is an online ESL (English as a Second Language) school for children in China. 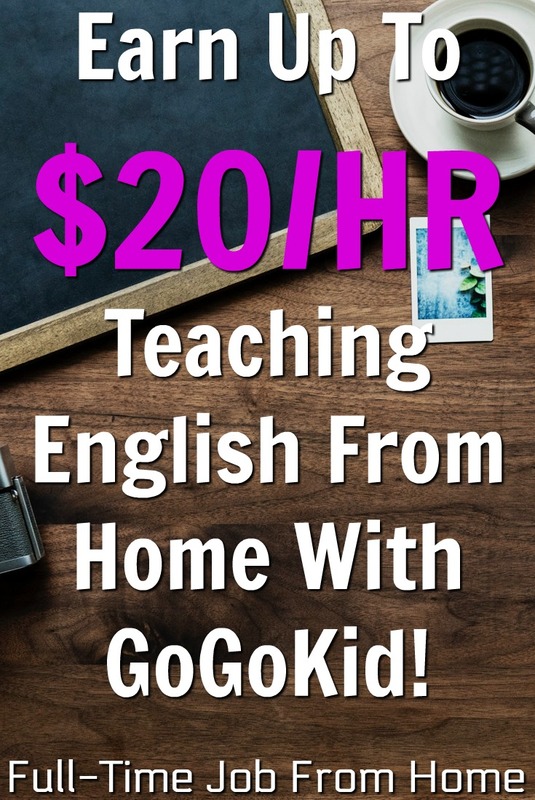 They claim to pay $14 to $25 per hour teaching English online AND tout a $300 bonus. I’m going to “sign up” and see how this all plays out! Working from home tutoring English is one of the most popular jobs online today, but the schedule won’t work for everyone. Make sure to check out My #1 Recommendation, it’s how I made over $13,000 last month and I set my own schedule! In this review, I will tell you all about the opportunity and what it takes to get the bonus! Want to apply? Go here and sign up! Start with your email and create a password. By signing up, you agree to their terms of service. When you sign up, they send you an email that you need to open and activate. The link they send you will expire in 48 hours, so do it right away! Are you legally authorized to work in the United States or Canada? Will you require sponsorship for employment visa status, for example, H-1B Visa Status? How did you hear about GoGoKid? Why do you want to teach online? When you submit your application, you’ll receive a message stating that you have applied and that the next step is scheduling an interview. During the interview, you’ll be asked to teach a demo lesson which is designed to familiarize you with the GoGoKid platform and teaching materials. You’ll receive details about the interview by email within 48 hours. I didn’t hear back from them in the 48 hours that they stated. I emailed them a couple of times for more info. Finally, over two weeks later, I did hear back. According to the response, they were waiting for me to schedule my interview. So I logged back into the portal where I signed up, and there it is, more details about scheduling my interview! They currently have no time slots available to interview, and it says that I should keep checking back. But my suggestion based on this it to definitely log back into the portal after 48 hours and look for the scheduling info. They also have review materials available. After the interview, it appears you will have an orientation and paperwork, followed by signing a contract. Note that after completing the application, I found out that a minimum of 1 year of teaching experiences IS required. So even though it’s an option to select ‘None,’ experience is in fact required. How Much Does GoGoKid Pay? According to their website, you can make $14 to $25 per hour. ZipRecruiter has jobs posted for GoGoKid. All are stating $14-$25 per hour, based on your education background, experience, and your interview performance. They are also claiming to have a $300 bonus for new teachers for a limited time. You will be able to set your own schedule. They provide you with everything you need for your lessons, so preparation is easy. They say that teachers can work from any location with a computer and Internet access. This makes it sound as though you could even teach from a coffee shop, but you might want to consider a more quiet area. The following tends to be the most requested time periods in Beijing time: Monday-Friday 6-10 PM, and Saturday-Sunday 9 AM–10 PM. Beijing time is 12 hours ahead of Eastern time zone in the US. So that would be Monday-Friday, 6-10 AM, and Friday-Saturday, 9 PM – 10 AM. They want you to choose consistent availability within these time frames. If you’re a night owl, or working another job, the weekends could be good for you! They do 6-month contracts with their ESL teachers. I didn’t find any feedback on GoGoKid. However, I did find their job listing for ESL teachers on more than one job site. None of the requirements were listed on the actual GoGoKid website. I found them on one of their job listings. It’s unfortunate because that’s probably why I didn’t hear back from them. And unfortunately, I’m not able to tell you how to get the $300 new teacher bonus. Is Online Teaching for GoGoKid a Scam? If you have the required experience, give it a shot! Here’s the link to start the application. Teaching English online is super popular right now, but might not be for everyone. Make sure to check out My #1 Recommendation to learn how I made over $13,000 online last month! How I Made Over $13,000 Online!